Israeli Foreign Minister Tzipi Livni claims “Hamas controls Gaza and is responsible for everything that happens” there (1), (2). YetYuval Diskin, head of Shin Bet, briefed Israel’s cabinet on January 6th, saying Israeli military strikes on Hamas’ leaders and infrastructure have made it increasingly difficult for it to govern (3). There is very probably some truth in that since Israeli strikes have killed everyone from police and police cadets to ambulance crews and targeted everything from police stations to government buildings and factories including food processing plants. So how can the Israeli government demand Hamas control what’s going on in Gaza while simultaneously destroying it’s ability to do so? (4), (5), (6). During the last ceasefire in 2008 Hamas did arrest members of the Al Aqsa Martyrs’ Brigade, Fatah’s armed wing, who it accused of firing rockets out of Gaza (7). How can the Israeli government demand Hamas do what it’s deliberately stopping them doing? The roadside bombing attack which “broke the ceasefire” on 27th January 2009 by killing an IDF soldier was not carried out by Hamas according to the Israeli government.Israeli Defence Minister Ehud Barak acknowledged that it was ‘not Hamas’, but a “breakway splinter group”, Al Qa’ida Affiliated Global Jihad (perhaps an attempt to link the Israeli campaign to the US ‘war on terror’). He then said that “We will continue with our response to the attack even though it was carried out by a group that is not Hamas…We hold Hamas responsible for everything that happens in Gaza.”. So they attacked Hamas (8), (9). More recently rockets were fired out of Gaza into Israel by members of the Al Aqsa Martyrs’ Brigades – the armed wing of Fatah. The Israeli government again acknowledged this, but attacked Hamas in “retaliation” anyway (10). If Israel’s aim is to prevent rocket fire why is it giving Hamas’ rivals a green light to fire at Israelis, knowing any counter-attack will hit Hamas? Probably for the same reason that Israeli artillery repeatedly shelled the main UN aid depot in Gaza when, as UNWRA head Chris Ging said, there was no fighting in the area (11). Claims that reducing rocket attacks is the priority are just electioneering. The aims of the blockade and attacks on Gaza are electioneering, overthrowing the elected Hamas government and dividing and conquering Palestinians to making annexing the West Bank easier. The event that triggered the end of the previous ceasefire is also supposedly Hamas’ ‘crazy’ decision to “unilaterally” end the ceasefire by firing rockets into Israel in December 2008. It’s not so clear that that’s the case. On 5th November 2008 Israeli forces launched a raid into Gaza, killing several members of Hamas’ armed wing – the Al Qassam Brigades. They claimed this was necessary to destroy a tunnel which Hamas were digging to capture more Israeli soldiers, like Corporal Gilad Shalit, who was captured or kidnapped by Hamas and other groups in 2006. They didn’t explain why, if this was the case, it was necessary to attack a tunnel into Israel by attacking it on the Gaza side of the border? This was the event that triggered Hamas’ armed wing beginning rocket attacks again (12), (13). Perhaps the upcoming elections in Israel, the fact the government were trailing the opposition in the polls and the claims by the Israel opposition that the government parties were “weak” and “soft on terrorism” were a factor in the “election war”. As with so many attempts to pander to the worst beliefs in order to try to get votes it’s backfired. The right wing Likud party has increased it’s lead in the polls, though Palestinians in Gaza could be forgiven for wondering whether all this “vibrant democracy” made any difference to them when the “center” and “left” parties bomb and starve them just as much. How can anyone seriously believe that a campaign killing 1,000 Palestinians in three weeks, including 250children, was a response to one Israeli civilian killed by rocket fire from Gaza in the previous six months (on Israeli foreign ministry figures)? – and that one death resulting from the Israeli raid on Gaza on 5th November 2008 which, along with Israel’s refusal to lift the blockade on Gaza, led to the breakdown of the ceasefire (14). There have certainly been thousands of rockets and mortars fired from Gaza, but although rocket attacks on Israeli civilians are certainly wrong they have killed very few people, unlike the thousands of Israeli shells, bombs and missiles fired into Gaza. If Israel’s government really wanted peace and to end the pointless cycle of deaths on both sides it didn’t need to do anything except accept offers of negotiation from the elected Palestinian Prime Minister Ismail Haniyeh of Hamas. The Israeli government routinely accuses Hamas of cynically risking civilians’ lives to gain support. In fact Israel’s government and main opposition parties are responsible for exactly the same on a much larger scale. Palestinians make a useful enemy and external ‘threat’ for Israeli governments to rally the public behind in nationalistic wars. Since in reality “as a military threat they are ludicrous” they can be repeatedly defeated with ease, allowing the government to point to “victories”. The opposition Likud party, whose leader Benjamin Netanyahu has called in the past for all Israeli Arabs and Palestinians to be expelled by force or ‘transfer’ can also deride the government for being weak in the face of the Arab threat. Israeli civilians and soldiers and a hundred times as many Palestinians may die each time, but that’s considered cheap in terms of votes gained. Many Israelis have motives to buy the “Arab threat” propaganda too. Some of them are getting cheap houses and land in the West Bank from it. Others have been brought up to think of themselves as “proud Israelis” and Israel as an inherently morally good country. For those who identify too closely with their government or don’t attempt to stay informed from multiple sources this leads them to see any criticism of their country as a personal attack on them. They can also see themselves as perfectly good and their enemies as inherently evil. This avoids having to face any uncomfortable doubts about whether they or their country are doing anything wrong. This is not unique to Israel. It’s true in every country, but also causes pointless deaths and wars in many – and Israel even more than most. Palestinians are now seen not as people who vary and each of whom may be right or wrong in certain beliefs or actions but as inherently evil enemies who cannot be negotiated with. That was true of Arafat and Abbas of Fatah when they won Palestinian elections and its true now of Hamas and Haniyeh. There are the usual responses by cheerleaders for Israeli actions to the widespread reports of Israeli forces targeting civilians in Gaza. The commonest has been a combination of denial and accusing Hamas of having been responsible for any incident where Palestinian civilians were killed, though there are several other tactics used. Ivor S Tiefenbrun for instance (Herald letters 26th January) says claims of Israeli forces targeting civilians and ambulances in Lebanon and Gaza and the West Bank (including Jenin) in the present and the past are “discredited…propaganda” based on the “ignorance” of “apologists” for terrorists. Like many others he also makes the false claim that every instance of Israeli forces killing civilians has been the result of their enemies “using civilians as human shields”. This is true in some cases, but in many cases it’s not – and in fact the Israeli military has often used Palestinian civilians as human shields itself. 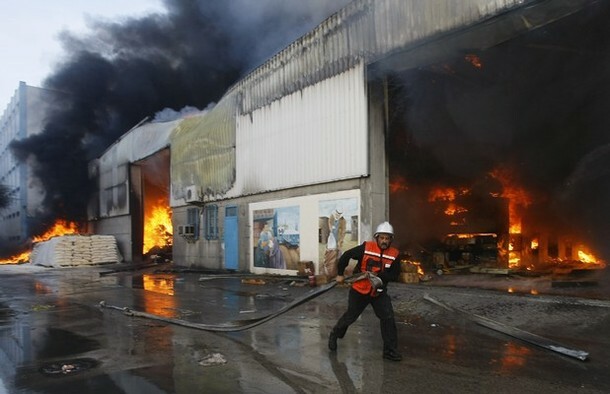 After the main UN aid depot in Gaza was repeatedly shelled by Israeli artillery, burning food and medicines, the Israeli government claimed Hamas had fired from nearby. On 15th January CNN quoted Chris Ging, the head of UNRWA, saying there had been no militants and no fighting anywhere near the depot when it was shelled (2). After the 2006 war in Lebanon and Gaza Human Rights Watch reported that “Israeli forces have systematically failed to distinguish between combatants and civilians in their military campaign against Hezbollah in Lebanon …The pattern of attacks in more than 20 cases investigated by Human Rights Watch researchers in Lebanon indicates that the failures cannot be dismissed as mere accidents and cannot be blamed on wrongful Hezbollah practices.” (3) , (4). HRW also reported at least 6 confirmed attacks by Israeli forces on ambulances in Gaza, paralleled by many similar attacks in Lebanon (5,6). This month it reported at least two incidents of Israeli forces killing or injuring medics when firing on ambulances (7). What’s more in 2005 Israeli soldiers reported following orders to shoot unarmed Palestinians even when there was no fighting taking place, including children. Palestinian and British doctors and journalists also came to the conclusion by studying injuries in dead children that they had been repeatedly shot in the head by Israeli snipers. The Israeli human rights group B’T Selem has reported similar cases (8), (9), (10), (11), (12), (13). There is also no doubt any more that the Israeli government and military are doing everything they can to deny the entire population of Gaza enough food and medical supplies. This campaign to deny Gazans enough food, medicines and fuel kills just as surely in the long run – and involves a fair amount of direct killing with tanks, artillery and air-strikes too. First they instituted a blockade which allows some truckloads of food, medicines and fuel into Gaza some days – just not nearly enough to supply the population according to the UN. By November 2008 the International Committee of the Red Cross was reporting that “chronic malnutrition is a steadily rising trend” along with “under-nutrition”. 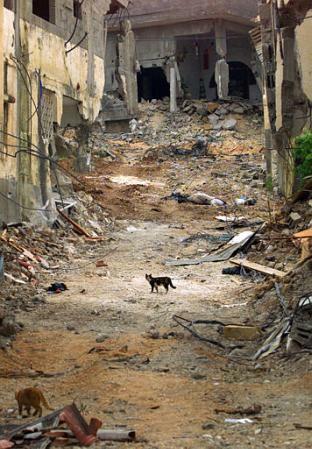 By December 2008 many Gazans were reduced to searching rubbish dumps for food. On 3rd February 2009 the UN reported that “The number of trucks allowed by Israel to enter Gaza daily to deliver much-needed relief supplies remains insufficient.” (14), (15), (16). The Israeli military made a great show of letting the media film them letting some UN aid trucks into Gaza, before shelling many of them with tanks and killing the drivers on the other side of the border, where no foreign media were allowed (17), (18). Then they bombed hundreds of civilian targets including the UN aid depot mentioned above, burning hundreds of tones of food and medicines with white phosphorus shells. Israeli strikes also destroyed over 200 factories and food processing plants, including the largest functioning grain mill in Gaza (19). The DEC appeal, by providing some simple facts such as the lack of clean drinking water and levels of malnutrition and suffering in Gaza, was an embarrassment for Israeli government PR men, which is probably why they demanded the BBC drop it. I’ve provided independent and reliable sources for all the above claims. So what are the sources Mr Tiefenbrun and others have for their claims that all this is ‘propaganda’ by ‘apologists’ for terrorists? ; The Israeli government and military maybe? Certainly if he was listening to Israeli Prime Minister Ehud Olmert then the Israeli military are “the most moral, the most high-minded military forces in the world” (20). Unfortunately as Professor Norman Finkelstein has pointed out, even Himmler and the SS claimed they were upholding the highest moral standards and only regretfully doing what was necessary to protect the German people (21). What the Israeli military has done in Gaza is not a Holocaust but statements about how moral you are don’t magically make every action you take right even when you’re targeting civilians either. Mr Tiefenbrun derides “closed minds”. If he believes the Israeli government, one of the sides in the conflict, are an unbiased source, while the UN, Amnesty and Human Rights Watch aren’t, then perhaps he’s the one who has a closed mind and prefers ignorance to unpleasant facts. You might even say that “his ignorance is matched only by his colossal arrogance”. Stating the facts is “beyond the pale” to him; a telling phrase, since it was first used by colonists in Ireland to deride the native Irish who they looked down on as sub-humans who could be killed without guilt. Like many others he acts as an apologist for Israeli forces’ targeting of civilians in fact free rants against those who deal with the reality and condemn both Palestinian terrorist groups and Israeli forces for targeting civilians. Other cheerleaders for the Israeli blockade and offensive have returned to the time honoured practice of the Israeli lobby – shouting ‘look over there, they’re doing it too, so why are you picking on me?’ ; so Sudanese war crimes in Sudan, Sri Lankan ones against Tamils and the Iraq war are raised as if these somehow make Israeli war crimes against civilians justifiable. Saying that Gazans asked for whatever they got by voting for Hamas has also become fashionable. This is idiotic in several ways. First hundreds of the dead are children too young to vote. Second half the population didn’t vote for Hamas. Third it’s hypocrisy. Israelis have repeatedly elected war criminals like Ariel Sharon and Ehud Olmert and even former terrorists like Begin – yet no-one suggested that because of this Israeli civilians deserved to be suicide bombed because some of them voted for war criminals. Then there’s the story that Hamas are evil but Fatah are good. This is just the continuation of the divide and rule strategy whereby in the past, when the PLO and Fatah were dominant in Palestinian politics, Israel backed Hamas to divide Palestinians (21). This is also hypocrisy again. When Israelis elected people with a long record of committing and ordering war crimes, from Deir Yassin to Qibya to Sabra and Shatila, like Sharon, no-one suggested Palestinians couldn’t be expected to negotiate with them. The biggest problem is the problem with any kind of nationalistic or religious jingoism – the attempt to pretend that “our side” are entirely morally good while the enemy are entirely “evil” and that any wrong done by our side either didn’t happen or else was all the fault of the “evil ones”. The reality is that there are very very few people who are entirely good or evil and pretty much no entire countries which are. Pointing out that Hamas are the democratically elected government of the Palestinian Authority and that Israeli forces also target and kill civilians is not a statement that Israel is evil and Hamas are good. It’s a simple statement of the reality – that both sides target civilians, that the stronger side (Israel’s government) has refused negotiations because it thinks it can get everything it wants by force. The Israeli government is also fond of claiming that Israel is “the only democracy in the middle east” besieged by “terrorists”. However Israel is not the only democracy in the Middle East. Lebanon and the Palestinian Authority have both held plenty of democratic elections. Yet Israel prefers alliances with election rigging dictators like Mubarak of Egypt and corrupt, torturing monarchies like Saudi and Jordan, while bombing other democracies. Not only that but it routinely elects and re-elects war criminals like Sharon and Olmert and its forces target civilians as much as any terrorist group. Another problem is the ludicrous belief that the other side will react in a way opposite to our own reaction to similar treatment. So Israelis are tough and their will is hardened by attacks that kill their soldiers civilians, but they assume that if they just kill enough Palestinians the Palestinians will surrender. You would think that six decades of Palestinians reacting to Israeli offensives that kill hundreds of them by hardening their attitudes to Israel would make Israeli politicians and generals realise the reality, but unfortunately so far only a minority do. Two, Avreh Cohen and Arieh Spitzen, were quoted by the Wall Street Journal on past Israeli backing for Hamas and on the likelihood that just as bombing Palestinians to drive Arafat and Fatah out of power led to the rise of Hamas, bombing them to drive Hamas out of power could lead to the rise of even more extreme groups like Al Qaeda (21). Perhaps, though, that’s the plan – kill enough Palestinians to make radicalize them in order to justify more bombing to “stamp out extremism”. That distracts attention to the land grab and new settlements in the West Bank. If Israel’s government really wants peace though negotiations that include Hamas are the only way forward. It’s become common for those people who think Israeli forces can do no wrong to claim that claims of war crimes in Jenin and Nablus in 2002 were later “discredited” or “proven untrue” – and even that this proved the UN and human rights groups were “unreliable” sources of information. This is then used as supposed evidence to claim Israeli forces have not targeted civilians more recently either. There is a tiny grain of truth to these claims which has been exaggerated so massively that the resulting claims are completely untrue. The tiny grain is that Amnesty International initially believed hundreds of civilians had been killed in Jenin refugee camp and called this a “massacre”, but after further investigations it and other groups found the number killed in Jenin itself was not hundreds but twenty-two. In the entire ‘Operation Defensive Shield’ which covered Jenin, Nablus and elsewhere 497 Palestinians were killed (according to Amnesty and the UN), including over 70 children (according to Amnesty). Physicians for Human Rights said around 38% of the dead were children, disabled or over 50 years old (1),(2),(3),(4), (5). During the Israeli assaults on refugee camps in Nablus and Jenin in 2002 there were initially allegations of the massacre of hundreds of civilians from some Palestinians. Amnesty international began an investigation and initially said that the forensic evidence they had so far seemed to corroborate the allegations. In their final report however they, along with Human Rights Watch and Israeli human rights group B’Tselem, found that dozens, rather than hundreds of civilians had been killed by Israeli forces, along with dozens of armed combatants. There were also armed Palestinian combatants killed, but this does not justify what was done to civilians. Eyewitness testimony from Israeli soldiers and Palestinians confirmed that Israeli forces had bulldozed many houses without warning, killing many Palestinians. Other unarmed civilians were forced to walk ahead of Israeli forces as human shields or shot or run over by tanks in the middle of the street – including at least one disabled person in a wheel chair. Ambulances, medics and aid organizations were prevented from bringing wounded Palestinians to hospital and even fired on and killed. Journalists were also banned from the area until days after the offensive ended. For instance B’T selem took this testimony from Israeli soldier Moshe Nissim who drove a bulldozer at Jenin. These are all quite clearly war crimes – a mixture of deliberately targeting civilians, not making any attempt to avoid killing civilians and using them as human shields. The fact that dozens rather than hundreds were killed in this way does not erase these crimes from history. Nor can Palestinian terrorist attacks on Israeli civilians. What’s more Amnesty reported that “Throughout the period 4-15 April, the IDF denied access to Jenin refugee camp to all, including medical doctors and nurses, ambulances, humanitarian relief services, human rights organizations, and journalists.” (2). So Israeli forces had 12 days in which to move or bury bodies – and bulldozers to do it with. So the 22 civilians Human Rights Watch found solid evidence of being killed in Jenin, like the 70 children cited by Amnesty for Operation Defensive Shield as a whole, may have been far less than the real totals. Any Palestinian witnesses could be killed, or, even more easily, dismissed as lying Arabs – the usual response of the IDF to any claim by any Arab witness. The UN report on ‘Operation Defensive Shield’ came to few conclusions of its own, preferring to merely summarise the different claims made by the Israeli military and government, the Palestinian authority and investigations by human rights groups, as if the two sides in the conflict were as unbiased as neutral third parties (4). So those who claim that claims of Israeli war crimes against civilians in Jenin and Nablus in 2002 were ‘disproven’ or ‘discredited’ are mistaken at best. This is even more true for those who claim this ‘proves’ the UN and all human rights groups are unreliable sources.